Based on the original Blues Gig In A Box, these 5 new classic blues songs in common blues feels will have you playing “real” blues music right along with a Pro band. But in the end… can you actually jump up at an open blues jam any better than you could before? So wouldn’t it be cool if someone would take all those little ideas that you learned 5-10 minutes at a time and showed you how to actually put them together? 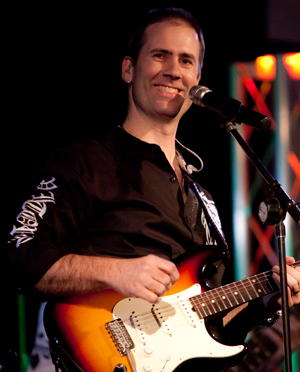 Even better… what if a professional blues guitar player showed you exactly how he would play a song from start to finish, and leave no stone unturned? Because what you probably already have are a bunch of tiny bits and pieces of the blues – a lick here, a chord or 2 there… maybe a cool blues rhythm or 2. You see, the Blues is like a puzzle… except instead of trying to make the picture on the box, you get to decide what the masterpiece is going to be in the end. Once I show you how to put those pieces together in 2 or 3 different ways, you will quickly see how to put them together in literally dozens of ways. Well that’s what Blues Gig In A Box was designed to be… the keys to the kingdom so to speak. And it worked… many customers of the thousands that got it told me it was the best blues learning course they’ve ever had. In fact, you can go on the Blues Guitar Unleashed Member Forum and read great review after great review so I won’t bore you with them here. 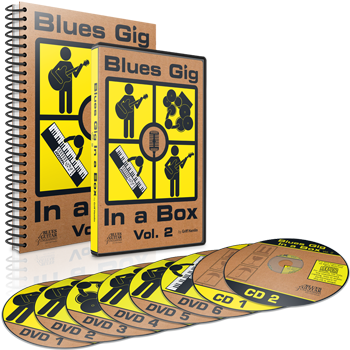 So now I’m thrilled to tell you that Volume 2 of Blues Gig In A Box is ready with 5 new songs in 5 new styles and a couple of other nifty new features as well including on-screen TAB and on-screen metronome. It’s all well and good to learn how to play a song note for note, but other than some technique practice you haven’t really made a lot of long-term growth. But when you go through a song and have each chord choice, each scale pattern, each lick, each intro, and each ending broken down and explained in terms of why it was chosen… now you’re getting some really good long term experience. And as much as we guitar teachers hate to admit it, experience is really the best teacher. But experience takes a long time to acquire… so I’ve always said that my job is to guide you through the process of getting experience in the shortest amount of time possible. In other words, instead of you beating your own head against the wall learning 100 songs so that you can start to see the patterns and the reasoning behind stuff… I’ve done all the leg work and put 5 more tunes on a silver platter for you. In the end, you’ll have the same amount of experience and the same result… but you’ll have a lot more fun and do it in a lot less time. Plus, you get to do it with a slamming band behind you (mine) and not some cheesy computer tracks or home-made rhythm section. Yes, that makes it take longer to make and it’s quite a challenge to get some parts right… but I’m sure you’ll agree the results are well worth it. What Will Learning These 5 Songs Do For You? You’ll know how to play complete songs… not just fragments. So you’ll get used to playing a song from start to finish which will help you learn more songs, faster. You’ll learn the most tried and true rhythm elements and chords for blues. These are arrangements that I have played as many as 180 nights a year at times so you can be certain these chords and rhythms really work for a LOT of different songs. You’ll see how I use the minor blues, major blues, and pentatonic 6 scales to create solos that follow the chord changes so you can steal these licks directly as well as create your own since you will know how. You will improve your technique easily and without doing a bunch of boring exercises. Because while the bulk of the music is not technically demanding, there are definitely some speedy licks here and there to give your chops a workout. You’ll learn how I approach “comping” (playing rhythm) on the guitar much like a piano player and use small, easy to grab chord shapes most the time. So you’ll be able to sound cooler while playing less – it’s a win/win. You’ll learn how to manipulate your dynamics with just your hands and the volume control on your guitar so you can create louder and quieter parts (and improve your overall control) with every new song you play. No more tap dancing on pedals to get more or less from your guitar. You’ll learn when “less is more” and just how much less you can get away with. One of the reasons so many students suffer is that they simply try to play way too much. There are many times (especially when backing up another soloist) that you can play… well nothing… and sound perfect! You’ll learn all the places you can simplify and alter a song to fit your level of technique. Sometimes you have to play what’s written but most times you don’t. By knowing what’s going on “behind the scenes” you’ll know exactly when you have to play something specific or when you can just do what’s comfortable. You have a full 365 days to check it out and put it through its paces. If it isn’t everything I said it would be I insist that you email me and let me give you your money back. So click the “Add To Cart” button below to get your copy of Blues Gig In A Box today before the price goes up to normal. 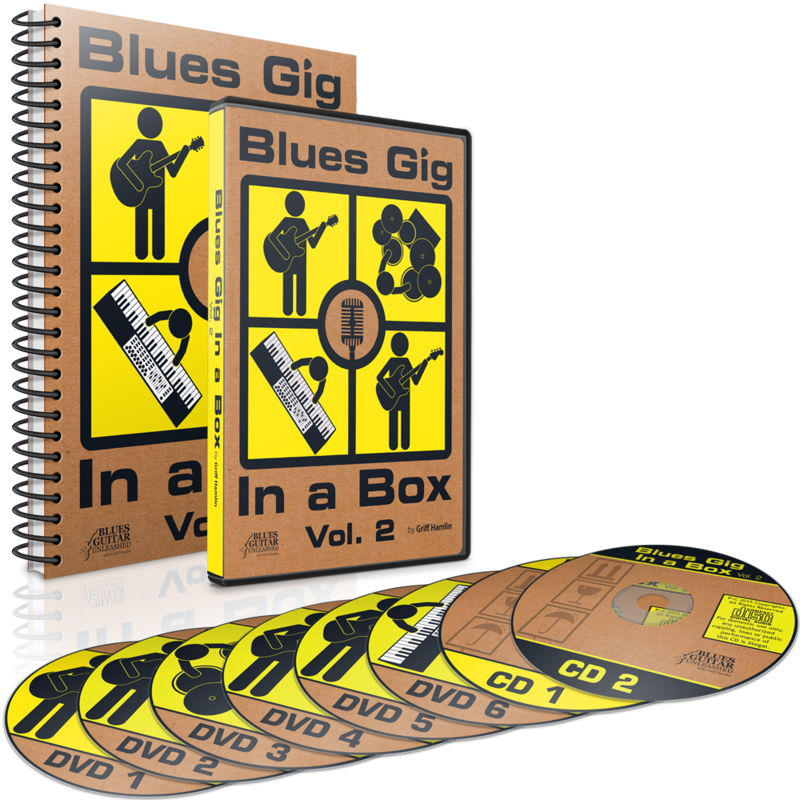 To get your complete copy of Blues Gig In A Box Vol. 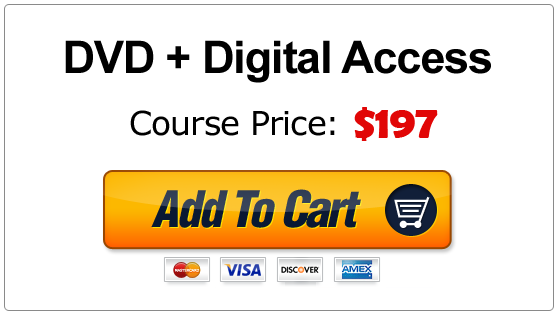 2 just click the yellow “Add To Cart” button below with your preferred delivery method. Just as soon as your order is complete you will receive an email with your access instructions to the secure Member Portal so you can be transforming your blues rhythm playing from boring to killer in just a few minutes from now! This is good for you and will help you. There’s no reason to keep messing around with little bits and pieces of stuff. This is how to make real blues music on your guitar – music that you’ll want to listen to and enjoy and share. So don’t wait and get your copy of Blues Gig In A Box Volume 2 today… and remember, you have a full 365 days to try Blues Gig In A Box Volume 2 and if you’re not totally happy with it just let us know and you’ll get a fast and friendly refund. 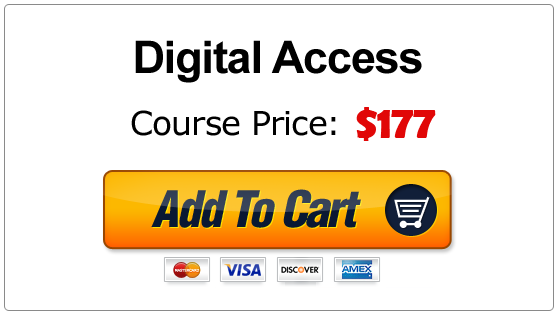 And you don’t even have to send the course back… there’s truly no risk at all to you.